Offering you a complete choice of products which include floor operated stacker. Our organization is a trusted name in the industry for wholesaling and trading Floor Operated Stacker. The product is used for stacking goods in stores and decreases the down time of work. It is sturdy as made from high grade of metal and alloys. Our product has been sourced from reliable vendors and checked thoroughly for the assurance of quality. We are known for the timely delivery of orders as well. 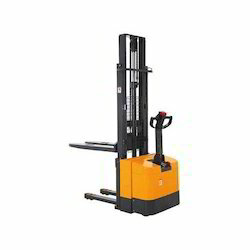 Looking for Floor Operated Stacker ?